Buoyed by a deep offense and Clayton Kershaw on the mound, the Dodgers are ready to make another playoff run—if their shaky rotation can hold up, that is. This week, SI.com is previewing all 30 MLB teams for the 2016 season, counting down to the No. 1 team in the league. At No. 5: the Los Angeles Dodgers. The Dodgers came a one-run Game 5 loss away from beating the ace-loaded Mets and advancing to last year’s NLCS despite the fact that their lineup—the NL’s fourth-most prolific during the regular season—had by October sustained more arrow strikes than St. Sebastian. Yasmani Grandal, the catcher who batted .282 with 13 homers and 36 RBIs before the All-Star break, was virtually debilitated by a shoulder injury that ruined his second half and on which he had surgery over the winter. Howie Kendrick was enduring the lingering effects of a badly strained hamstring. Yasiel Puig, also with an injured hamstring, had one hit after Aug. 27. Even Justin Turner, the third baseman who nearly single-handedly kept the Dodgers in the series by batting .526, was playing with a bum left knee that would shortly thereafter require a microfracture procedure. With the steady Adrian Gonzalez still cleaning up, the Dodgers’ offense should again look like the one you’d expect from baseball’s highest-paid club, though the team announced in late March that outfielder Andre Ethier will miss up to three months due to a fractured tibia. Even so, a fourth straight playoff berth—this one under new manager Dave Roberts—could be just the start. Clayton Kershaw stands alone, no matter what. But on the Dodgers’ staff, at least in the early going, he’ll be out there on his own island. The loss of Zack Greinke—he of the 1.66 ERA last year—to the Diamondbacks was always going to hurt, but now, says one scout, “You got question marks in your rotation.” Brett Anderson, re-signed in free agency, had back surgery in early March that will keep him out three to five months, and Brandon McCarthy, Frankie Montas and Hyun-jin Ryu might also be out until mid-summer. Even would-be–fill-in fifth man Mike Bolsinger is likely to miss the start of the season with a strained oblique. If only all scouting trips were as productive as the one the Dodgers’ staff took to Mexico in June of 2012. 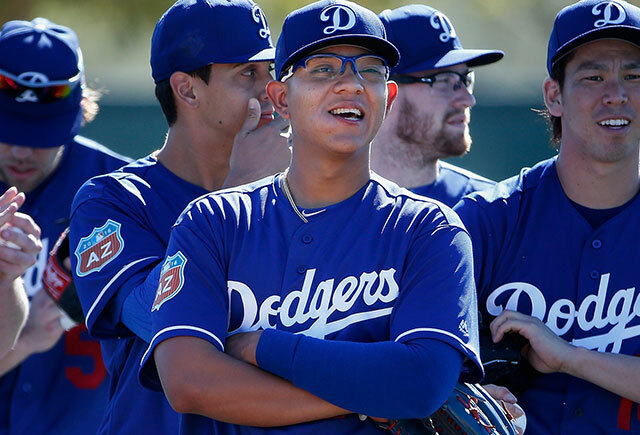 That excursion yielded not only Puig, who held a series of showcases south of the border, but also Urias, who is now baseball’s best pitching prospect. The southpaw has mostly dominated in the minors, pitching to a 2.77 ERA with 10.7 strikeouts per nine over his three seasons, thanks to an advanced three-pitch repertoire that includes a fastball that sits at 94 mph, a sharp curveball and a precocious changeup. He is the exact type of weapon a pitching-thin, would-be contender might immediately turn to, except for a couple of things. For starters, he only turned 19 in August, and he’s yet to throw more than 87 2/3 innings in a professional season. Second, he worked only 80 1/3 frames last year, due in part to a mid-season operation on a benign mass in his left eye—a condition that has long rendered it nearly closed, though he says he can see out of it.